A recent Wall Street Journal article discussed parents rebelling against school fundraisers. They are tired of being hit up for money. In Houston and elsewhere, school kids go out and sell wrapping paper and candy to raise money for schools. Often only about 50% of the money collected really goes to the schools. The parents profiled discussed solutions to the problem. Most of the solutions involve giving money directly to schools and teachers. A few years ago my sister-in-law in the Chicago area asked me to buy wrapping paper for her son’s school. This fundraiser was being run by the local PTA. I told her I would join the PTA but I would not buy the rip-off wrapping paper. That is how I became a member of the Illinois PTA. The solution to all this, of course, is to collect sufficient taxes to run our schools. People will pay for what they value. It’s clear enough the value our society places on education. While in Texas there is speculation, much of it idle, about who might run against Senator John Cornyn, in Minnesota Al Franken is running to defeat Republican Norm Coleman and win back Paul Wellstone’s seat. An early poll shows Coleman ahead but vulnerable. Coleman is running below 50% though Franken has some fairly high negatives. The 2002 death of Senator Wellstone right before the election, and the defeat of his ballot replacement Walter Mondale, remain painful to recall. Normally I don’t like thinking about an election so far in advance. An endless election cycle is not good for governing the nation. However, in this case, I’ll make an exception. I don’t know if Franken has a primary challenger or not. What I do know is that I will be following this race and will donate money to the Democratic nominee. This is my 200th Texas Liberal post. I’m appreciative of everyone in Houston, in Texas, and elsewhere who has read the blog and, in some cases, left a comment. There are three aspects of personal identity that lead me to write this blog. These aspects of my identity are shared by many others. Retaining individuality while embracing what people have in common is always a worthwhile goal to pursue. Most essential is the simple fact of my humanity. I am one among many. I am equal with all others. This sense of shared humanity is why I’ve written the words “All People Matter” at the top of this blog. Next is my citizenship. I have all the political rights and obligations that citizens in a democracy have. This blog is a manifestation of my citizenship. And then there is my liberalism. My ideology is important to me as it helps define how I view my humanity and my political role as a citizen. I believe that political liberalism in the New Deal/Great Society sense is one good practical expression of the belief that all people matter. Of less value to me is identification with the Democratic Party. I knew little about political blogs before I started Texas Liberal. I’ve been surprised to the extent a Democratic Party line is followed in some, though not all, left-leaning political blogs. I say this while at the same time believing that political party discipline is the best way to organize a legislative chamber. Political parties give voters options and establish more clear lines of accountability for what takes place in a legislative body. If I were running for office instead of being a blogger, I might stick closer to a party line. On a purely Texas note, I’ll never understand how many of my fellow Texas left-leaning bloggers can be more loyal to the Democratic Party than I am, while at the same time accepting that the Texas legislature is organized on a so-called bipartisan basis. This acceptance undermines the right of Texans to have options at the voting booth and means that Democrats will never have a clear and clean governing majority in Austin. In any case, I enjoy having a blog and I respect many of my fellow Texas Bloggers. I’ve had a lot of support from friends and strangers and I’m fortunate to have the time needed to express myself through Texas Liberal. Please keep reading as I try to make Texas Liberal even better. Far removed from the icky black fish and sleepy turtles of Buffalo Bayou in Houston, I saw giant dolphins last week off the coast of San Diego. These big dolphins appeared near the whale watching boat I was riding. There must have been at least 30 of the big dolphins. The dolphins were Risso’s dolphins. They grow up to 13 feet long. I saw them about 9 miles out in the Pacific Ocean. These dolphins have the good sense to avoid the coast. You’ll find nothing on shore but humans. 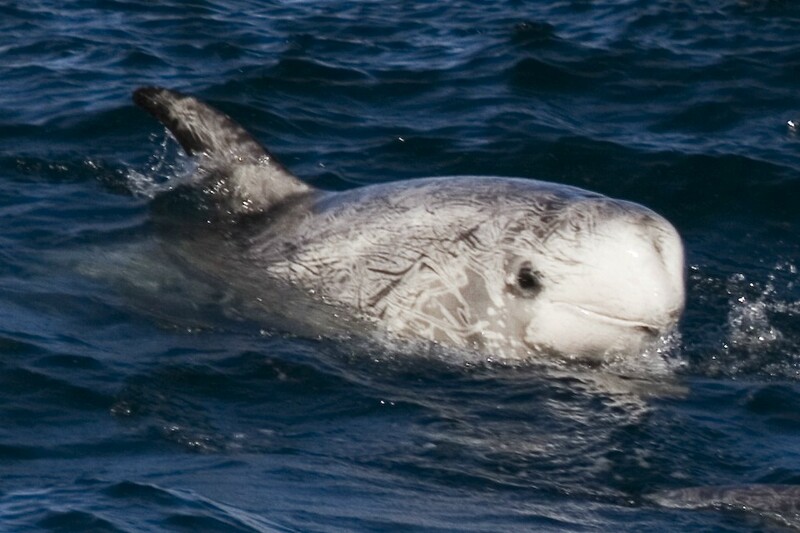 While they are eaten in Japan, Risso’s dolphins are not considered threatened. Many live in the waters off of California and there are communities of them elsewhere in the world. The above picture is not so good, but it is pretty much how they looked from the boat. Though I’ve seen bottlenose dolphins many times in Galveston, it was odd to see real wild animals in a natural setting. Dolphins in Galveston seem like city creatures— Such as armadillos in Houston. In my view, nature is best seen in a park or on TV. I’m all for paying the taxes needed and establishing the regulations needed to protect nature and the Earth. I just don’t want rattlesnakes or mountain lions coming at me. Watching giant dolphins from the deck of a boat was interesting. I’ll pay extra attention to the next nature documentary I see. My friend Kate, who lives in California, and who once lived in Texas, is on jury duty. She has a trial that will last many weeks. She is at the same time working her regular job. Kate is up front about this not being ideal situation. It is hard work. Yet the bottom line is that Kate showed up for jury duty when summoned and that she is meeting her obligations as a citizen. Kate knows that the highest title and most complex job anyone can have is citizenship in a democracy. The great honor of our citizenship is that it is shared with many millions of people. It is the things that are jointly held that matter the most. The complexity of our citizenship is found in the difficulty of balancing our private interests with the public good. Finding this balance requires the discipline of critical thinking and personal effort. What is excellent about this complexity is that any person of average intelligence–Kate is very smart– can find a reasonable enough solution if they are only willing to try. Again—The best things in life are the things that are open to all. Kate is an excellent citizen. I can’t think of a better thing to say about a person. In Houston, in Texas and in all places, the rich have too much influence over the political process. The best line I ever heard about this influence was offered by former California Governor Jerry Brown. Running for President in 1992, Brown said the Presidential race was a gong show for the rich. He said that when the rich got tired of a candidate they gonged him out. That is great imagery. I’ve met Jerry Brown twice. Each time he was a bit sour. In 1976, when I was 8, I met Jerry Brown in Providence, Rhode Island. Brown was campaigning in the Rhode Island primary. Brown and Senator Frank Church of Idaho had entered the race late and Rhode Island was one of the first tests involving Brown, Church and Governor Carter. I asked Brown for an autograph. He gave me the autograph, but he came off as grumpy and aloof. The next time I met Brown was at Cincinnati City Hall during his 1992 Presidential run. I worked for a Cincinnati Councilmember at the time. Brown was in town looking for support from elected officials. I told Brown I had met him in Rhode Island in 1976. He reminded me that he won that primary. He was, as he had been 16 years before, somewhat standoffish. Maybe Brown just did not like me. Brown is currently the Attorney General of California. Though I follow baseball and attend Houston Astros games, I’m reluctant to post about sports. Sports get enough attention. However, one thing that merits additional attention is the Houston Astros policy against bringing your own food and drink into the former Enron Field. I thought of this last week standing outside of Petco Park in San Diego. Posted rules at Petco Park state that you may bring in your own food and drink. Astros games are expensive. A family of four buying what are lower-priced tickets at $17 a shot, and then paying to park and buy food is going to spend at least $125. And I bet that is a low estimate of what such a family really spends at a game. The food at Astros games is overpriced and not very good. The Astros play in a taxpayer funded stadium. The least they could do is let people bring in their own food and drink. This would make games more affordable and would allow people to bring in healthy food in contrast to the junk currently offered. 1. Unlike smaller cities that may be more dependant on tourist dollars, or unlike a resort or cruise ship, a large city retains an identity outside of what visitors expect. 2. Connected to the first reason, workers in large cities have more options for employment beyond the whims of outsiders. 3. You can’t help but see a measure of real life in a large city. While I realize people take vacations to get away from real life, I enjoy seeing residential areas in places I visit. I enjoy seeing aspects of the overall nature of a place instead of just hotels and restaurants. 4. It is good to be in public view. When on a public sidewalk instead of at a resort or on a cruise ship, I am out with the random crowd. That’s the most democratic way to take a vacation. It is difficult to say anything nice about someone driving a yellow Hummer outfitted with a radar detector. I’ve seen such folks in Houston before and never said a nice word. However, I have to admit that I gave a wave and a smile to the driver of just such a vehicle a few days ago. He let me into traffic in a tight spot. You never know when you’ll find some good in even the most annoying and global-warming inducing person. My spring blogging break is a winner and I’ll be back to normal posting in a few days. TexasLiberal is going to take a spring break. For the next week I’ll be posting sporadically at best. The way I figure it, either you run the blog or the blog runs you. Maybe I’ll visit Seabrook, Texas during my spring break. In my absence, and at all times, you’d do well to read Terrell Today. Terrell Today covers Terrell, Texas and Kaufman County. Regretfully, I have never been able to visit these places. Kaufman County borders, among other counties, Dallas County. According to the Texas Almanac 2006-2007, Terrell had a 2004 population of 15,600. Kaufman County was just at over 85,000 people. The Almanac reports that Kaufman County has some manufacturing and is also a bedroom community for Dallas. Terrell is the home of Southwestern Christian College. It would be great if every smaller city and moderately sized county had a top quality blogger as does Terrell and Kaufman County. Check out Terrell Today and support a valuable resource for that community. Houston State Senator Rodney Ellis is a leading supporter of bringing casino gambling to Texas. I’m disappointed by this because I normally regard Senator Ellis well and because gambling brings misery. Senator Ellis should be advocating a progressive income tax for Texas that would raise the money Texas needs to fully join the civilized world. However, if we are to have casinos, I propose one be built on the ancient submerged ice age era coast 100 miles south of Galveston. This lost coast is being now explored by sonar and submarine. We’re always told that a big reason for casinos is to create jobs. Think of how labor intensive constructing an underwater casino would be. Also, by submerging the casino in advance of hurricanes and global warming, we would be avoiding trouble and expense down the line. It’s possible that employees in the underwater casino might in time develop fins and gills and become hybrid human fish. These hybrids would be a great drawing card and could be trained to sing and dance for stage shows. An underwater casino is clearly the way to go for any expanded gambling in Texas. The multi-ethnic North African nation of Mauritania is conducting its first fully free elections since independence in 1960. Living in multi-ethnic Houston, I’m rooting for these folks to work it out in a peaceful way. Mauritania has Arabs, Berbers and sub-Saharan blacks. Many of the people are nomads. Just over 3 million people live in Mauritania. Anyone getting along anywhere is good news. And any country moving towards democracy is good news. Good luck to Mauritania. Houston Mayor Bill White wants to negotiate benzene emissions cuts with industrial plants located outside Houston city limits. Not surprisingly, this idea has run into resistance from the cities where the plants are located. While Mayor White is doing a good thing, one can also sympathize with the mayors of industrial cities like Pasadena, Baytown and Deer Park. It’s easy to say these small city mayors are beholden to the large industrial facilities in their towns. It’s more difficult to say where the people who live in these towns will find work if the plants go elsewhere. 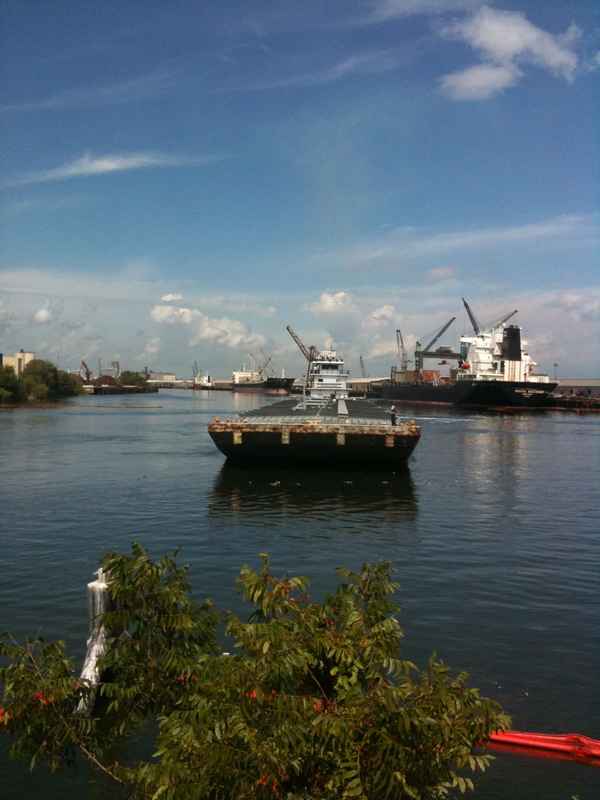 Solutions to air pollution problems in the Ship Channel and in the Houston area require help from outside our area. Ideally, Austin would help. That help is not likely to come in this legislative session. Stricter federal regulation would make it more difficult for plants to threaten to move elsewhere. The current administration in Washington is not likely to propose such regulations. I’ve driven around Pasadena, Baytown and Deer Park. These cities need help. I don’t blame people who are afraid of job losses in these towns. Efforts by Mayor White for cleaner air are needed. However, real progress is going to have to come from Austin and Washington. Tougher regulation is needed across the board and not just in one metro area or region. As frustrating as things often seem in Texas and in the United Sates—imagine being a blogger in Iran. A new law in Iran requires bloggers to register with the government. A BBC feature gives the reaction of some Iranian bloggers to the new law. It’s important these things be discussed among those of us lucky enough to live in a place where freedom of expression is, as things go, allowed. No blogger is an island. Nor is any reader of blogs. A few days back, I watched on C-Span a speech given by the King of Jordan before a joint session of Congress. Watching the broadcast, I can’t say I was surprised to see Houston Congresswoman Sheila Jackson Lee sitting on an aisle seat as King Abdullah entered the House Chamber. She might’ve been camped out in that seat like something out of Woodstock. I should’ve scanned the television picture for her tent. The C-Span audience got to see Ms. Jackson Lee whisper something in the King’s ear. Did she tell the King that maybe Jordan should start having more free elections and allow more press freedom? That would‘ve been good. Ms. Jackson Lee always finds the camera. A few months ago I watched on C-Span the groundbreaking for the Martin Luther King Memorial on the Mall in Washington. Ms. Jackson Lee was right up on the podium. A few years ago, when I lived in her district, I sent Ms. Jackson Lee a letter opposing any privatization of the United Sates Post Office. I never got a reply. I wish Ms. Jackson Lee would focus more on her duties and focus less on getting her picture taken.